During a Structural Appraisal Inspection in the Surbiton / Kingston area, we noted cracking to a block of flats located in a good residential area in Surbiton. 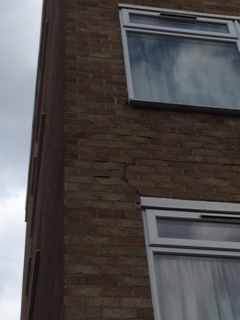 A common inherent structural defect in 1960’s properties is cracking around window lintels. This occurs due to the dense concrete lintels having a different coefficient of linear expansion than the adjacent brickwork. For example, the concrete lintel hardly moves at all but the brickwork does. As a result, this causes characteristic cracks to develop. This commonly takes the form of stepped cracks and is often seen internally where the plasterwork is cracked. We would recommend simple raking out of defective / cracked pointing and use of a flexible mortar.